I hope you enjoy this very short (27 page) book that shares some of my most powerful strategies for achieving success and fulfillment while striving to make positive change in the world. Although I wrote these pieces for students, I have found the exercises and reflections useful in virtually all aspects of life. The document (click link above) has been saved as a pdf that can be accessed, downloaded and printed via any computer or digital devise. So please share with any friends, colleagues or family members who may need a little support or inspiration! Research universities are often viewed as engines for economic development, touting impacts related to start-ups, tech transfer and regional labor markets. This identity, when viewed within the knowledge economy paradigm, positions universities and colleges as critical assets and catalysts for regional growth and vibrancy. But similar expectations could hold within the space of global development. Clearly, universities and colleges offer resources and expertise that map to virtually every area of community need and challenge. Our institutions and faculty boast relationships with organizations and regions literally all around the world. And perhaps most importantly, our students are increasingly demanding high-touch learning experiences that connect them with real-world challenges, helping them to develop skills and competencies that are prized and rewarded by employers and gate keepers. And our global partners are equally poised to engage. Even in the most underdeveloped countries and regions, colleges and universities sit ready to actualize their latent potential, holding riches in the form of technology and expertise, and connecting with community partners and leaders who share similar goals and commitments. And almost universally, these institutions are viewed as capacity builders within their larger systems, and are held responsible for developing the infrastructure and expertise needed to address the pervasive economic and social challenges that undermine long-term success and prosperity. So what stops us from tapping into the potential of global engagement with both sides so ready and willing? As someone who has studied and tinkered in this domain for almost 15 years, I can assure you that the challenges are more complex than we might think. In addition to a growing aversion to anything deemed outside one’s core mission or strategic priorities, the very engagement models that we continue to pursue are structurally limited in their ability to catalyze impacts of the magnitude or nature that we so desperately need. You see, higher education approaches partnerships in a way that is highly localized and self-directed. As we pursue specific grants or cultivate courses or target initiatives, we have well-defined goals and objectives that serve as the drivers of our engagement. Because our aims are inherently localized and specific, their reach, by design, is inherently limited. That is, even if our efforts are wildly successful, because of their localized focus and points of connection to the surrounding communities, they are restricted in their ability to catalyze broad and lasting impacts. And this localization in turn makes them inherently fragile and vulnerable, and highly dependent on the specific players and context that supports and nourishes them. With that said, this doesn’t have to be the case. In fact, global partnerships (or really any partnerships) can be designed to be highly sustainable and expansive in their impacts. In fact, we can transform partnerships- perhaps not all, but surely the particularly strong and robust ones- to serve as catalysts for community development and impacts. We simply need to create models that have these features structurally integrated- think of them as parameters and inputs that are designed into their very architecture. And of course we need to nurture and support them, building out networks and related expertise- just as we do for any area of focus that is deemed both important and complex. This notion of catalytic global engagement is what drives my own work and lays the foundation of our new Global Partner Studio initiative that I look forward to introducing in the months ahead. I can’t tell you how excited I am to share this work and invite your collective participation in its continued build-out. I believe that it is truly a focus worthy of our best investment and innovation. And I can’t wait to see what we accomplish as we create engagement systems that are inherently generative and catalytic, by design. It’s been just over a week since our return from Tanzania and I’m still working to process all that transpired. We had no idea that sanitary pads would feature so prominently in this trip or represent such a galvanizing focus for social entrepreneurship. Both Danielle and Lyndsey had researched this topic as part of their ELN independent studies and were well aware of the connections with girls’ education and public health. But seeing Danielle working on the reusable pad project was an emotional experience for all of us. The idea had come from her final study abroad project and when she discovered Dare Women’s Foundation’s model via an internet search, they had offered to train our partners in Musoma. Danielle quickly raised the funds needed to support Stephen Marwa’s (Executive Director of Hope Revival Children’s Foundation) travel to Arusha. And here we were, returning just one year later with sewing materials, ready to support the start-up of a Musoma-based reusable sanitary pad project. To our surprise, the very next day Stephen delivered the first batch of reusable pads (see featured photo) and I was proud to be the second customer -Danielle being the first. Stephen explained that after the pads are certified by the Ministry, they will be manufactured and sold. Proceeds will sustain the sewing project while also supporting school-aged girls unable to afford appropriate menstrual supplies. I was so pleased with the pads that I carried the prototype with me as we visited leaders and organizations throughout the area.When we were introduced to the Anglican Bishop of Musoma, Dr. George Okoth, he was so impressed with the project and our interest in menstrual management that he asked us to visit a Safe House in Mugumu Serengeti where village girls fled go to escape Female Genital Mutilation (FGM). He explained that they had acquired a disposable pad machine that was sitting in storage, without any institutional knowledge about how to operate or fix it. Although Muguma was a clear departure from our itinerary we were all eager to accept the invitation. With a recent Engineering grad (Mathew Falcone), our own Macgyver Librarian (Cindi Tysick), and resident pad experts (Danielle and Lyndsey), how could we pass up the challenge? Our 2+ hour drive to Muguma was both fascinating and bumpy. We winded our way around the massive Acacia gold mine as we tried to anticipate what lay ahead. When we arrived at the Mugumu Safe House we received a brief tour of the facility while learning about the daunting challenges facing the girls. And then Melina (Director) showed us the pad machine. It was sitting in a a storage closet draped in plastic, obviously never touched or utilized. We all stood and stared at the impressive contraption, trying to comprehend what we were seeing. Then Lyndsey yelled, “It’s from the Pad Man!” We knew this to be a movie that our UB School of Management colleague, Debbie Grossman, who had visited Tanzania with us the last year had urged us all to see- but we hadn’t had had time. Within seconds the girls were texting Debbie and miraculously even though it was the crack of dawn in Buffalo, she immediately replied, confirming that the machine was indeed the same type and make of Indian apparatus featured in the movie. And then they were off- a quick assessment (with the help of YouTube) revealed that nothing was wrong with the machine. There was simply no Tanzanian adapter for the Indian power cord. Dan quickly surrendered his travel converter and the machine immediately purred into action. Between Cindi and Matthew the first prototype was produced in minutes and once the girls got the hang of it, the Muguma Disposable Pad Project was born before our very eyes. But our biggest joy came as Melina recognized what she had just stumbled upon. Suddenly, her prospects for supporting and stewarding the Safe House and its girls were much more promising. How to celebrate the promise of girls’ empowerment in the Mara Region? 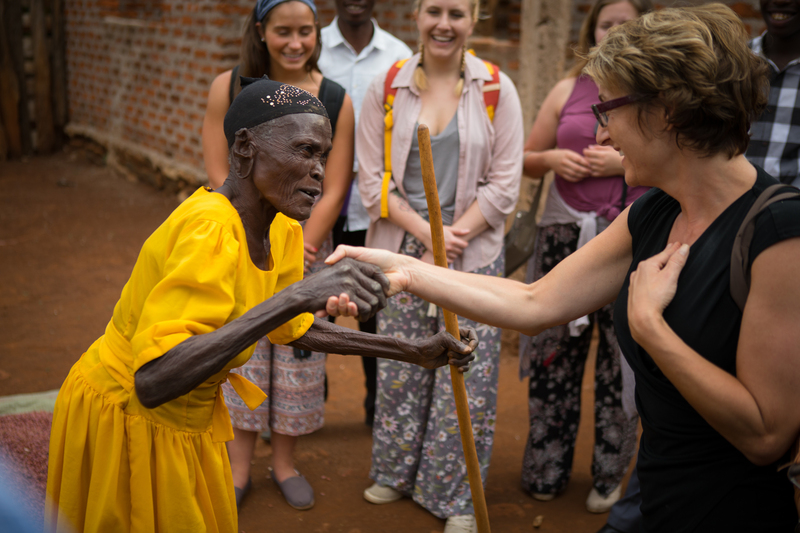 Early in our trip we were treated to unforgettable dancing and poetry by the new “Musoma Action, Girls Empowerment” group led by partner and friend Monica Achieng. These beautiful girls were gathering to celebrate their solidarity and share inspiring messages about education, self-empowerment and women’s health. As we reflect on the beauty and vibrancy of the young women we met throughout the trip and the promise of their collective futures we can’t help thinking about menstrual management and girls’ empowerment in a new way. Clearly, there is much to celebrate and infinite opportunities to learn, share and collaborate around this important topic. As I prepare for my upcoming trip to Tanzania I am overcome with a palpable sense of readiness- the knowledge that this trip will usher in a new and more impactful stage of engagement. One that is worthy of our collective hope, inspiration and commitment. The fact that it has taken nearly 10 years of travel and engagement to finally reach this point strikes me as somehow important and worthy of unpacking. What do I mean by being ready? It’s as if the conditions for engagement have finally reached some magical threshold or tipping point, setting our partnership into motion. Like a fan whirring into action, I can feel the speed of collaboration accelerating, the ambient space expanding, and interest and possibilities literally swirling around us. Why has it taken so long? While our collective readiness is a catalyst, it is itself predicated on smaller currents, each complex and fragile, inherently necessary yet insufficient on their own. I am reminded of this fragility as I reflect on my own work at the University at Buffalo. Only now, after 15 years of stewarding strategic engagement, am I confident that we are poised to actualize our potential. With the embrace of high-impact experiential learning, the creation of the Experiential Learning Network (ELN) and our new Global Partner Studio (GPS), we can now support and leverage engagement toward greater impacts, sharing stories and building further capacity through our new journal, digital badge and curricular tools. When I reflect on the readiness of our Tanzanian partners, the growth is undeniable. Community leaders who have embraced the gifts of communication and technology are emerging as liaisons and change agents, boldly seeking additional resources and support; higher education institutions are open to partnering and sharing course content, travel experiences and technology-supported resources. But none of this would be possible without the students and faculty who are seeking more meaningful levels of connectivity- activating their learning, teaching and research in ways that will take us farther and deeper into communities, complexities and the promise of collaboration. When I think of the perseverance that it’s taken to get to us to this point of readiness, it’s not surprising that we have been tempted to withdraw or retreat along the way. As human processors we are terrible at discerning progress until we pass through some undeniably tangible milestone or indicator of success. In fact it is often just before we reach that turning point that our frustration and fear pull us into the weeds and out of the game. As I think about my upcoming trip it is clear that many pieces are now firmly in place. Our partners are busy leading and communicating, our institutions are ready to leverage the benefits of our engagement, and students and faculty are eager to get involved. Even my own family members are contributing and connecting as the boundaries and barriers continue to melt away. Maybe this notion of readiness represents an exciting new frontier. Once we have interest and resources to share, the challenge is really one of activating potential, making sure that the structures, processes and people are in place to support, catalyze and harvest the fruits of our collaboration. But if we are truly committed to the work, imagine all that is possible. Imagine what we will accomplish, together, when we are ready. How far will we travel with our international partners? June 1, 2018 April 7, 2019 by mbhuber2013Leave a Comment on How far will we travel with our international partners? Hello Everyone. I know it’s been a while since I last posted, but I’ve been hard at work on some very exciting initiatives. And I think it’s finally time to share a sneak preview of what’s in store. Many of these programs and resources will be open to broad participation so I look forward to engaging in the weeks and months ahead, and would love to hear from you if these ideas resonate with your own work or interests. In addition to following my blog, be sure to visit our Experiential Learning Network (my center at UB) webpage and join our Student or Faculty/Staff Listserv to get monthly updates about related activities and events. GPS is an evolving platform for cultivating deep and meaningful engagement with our international partners. Look for partner profiles and impact stories, but also opportunities to “harvest” student projects, COIL (collaborative online international learning) courses and travel-based engagement for faculty, students and community members. We will feature international partnerships that include both higher education and community-focused organizations to allow for deep and reciprocal impacts. With the Buffalo Tanzania Education Project (BTEP) as the foundation for GPS, we are excited to take our international partnerships further and deeper toward new possibilities for engagement and collaboration. The week of October 1st we will welcome invited GPS liaisons to UB/Buffalo for a week of sharing, capacity building and engagement. Our guests will represent partnerships in Ghana, Tanzania, Zimbabwe, and Jamaica and will engage through presentations, studio sessions, and programs with our UB and Buffalo communities. With a focus on social innovation, global health, and community development, we will have many opportunities to explore synergies and shared interest. And we look forward to introducing our global friends to the many cultural, entrepreneurial and civic gems that Buffalo has to offer. This fall we will be launching the Global Partners Studio (GPS) Journal that will be open to undergraduate and graduate students as well as our international partners. This open-source digital journal will be an accessible and dynamic place for sharing collaborative research and experiential learning projects, and connecting resources and opportunities. The journal will also be a repository for impact stories highlighting the points of connectivity and synergy that evolve from high-impact engagement. We will be open for submissions this fall with an anticipated spring release of our inaugural edition. For those looking to build on recent collaborative experiences, we will be launching a new Global Collaboration digital badge (micro-credential) in the fall. Participants will be mentored through a series of reflective and integrative exercises, allowing them to gain deeper insights while developing compelling narratives to support their academic, career and/or civic-related goals. Next year (July 2019) will mark the 10 Year Anniversary of my first trip to Tanzania, the genesis of our unique global engagement model. To honor and celebrate our extraordinary relationship with our partners in Tanzania, we will be hosting a community trip in collaboration with a local travel organization. We will also be releasing an updated version of our book detailing the evolution of our engagement over the past 10 years. Stay tuned for more on both of these exciting initiatives. As we near the 50% mark for our crowdfunding campaign, I’d like to introduce you to another amazing partner who continues to inspire and challenge our students. This is Dr. Mwita Akiri, founding Bishop of the Anglican Diocese of Tarime, one of the smallest and quickly growing in Tanzania. Prior to this post, Bishop Akiri served as the National General Secretary of the Anglican Church of Tanzania for almost 10 years. He holds a PhD from Edinburgh University in Scotland and is also a Research Professor of African Church History and Missiology at Wycliffe College, University of Toronto. To say that Bishop Akiri is charismatic, would be a huge understatement. When he speaks with our students, he captivates them (us) with his passion, sense of humor, and an eagerness to challenge their thinking through provocative questions and fascinating conversations and insights. But even more captivating than his personality is his commitment to improving the lives of the young women and their families who live in the villages of Tarime. Through his visionary leadership, Bishop Akiri is bringing bold ideas and programs to this underdeveloped region where girls marry early and life is difficult and unrelenting. Through a burgeoning sewing project, he asks girls and their families to give him one year before entering into marriage, in order to learn valuable sewing skills and develop a means for self-sufficiency. When we visit Tarime, our students engage in conversations with the girls, even visiting their homes and learning about life in the villages, and the many complexities and surprises surrounding the practice of early marriage. Although the Bishop is committed to expanding the sewing project to provide graduates with opportunities to earn their own sewing machines, he recognizes that education must go much farther in order to impact lasting change in Tarime. One of the highlights of our trip is visiting the Pre-Primary School sponsored by the Anglican Diocese, where local children come to learn under the direction of a very dedicated volunteer teacher. Although the school lacks many of the items- such as desks and books- that we consider essential to learning, students are eager to learn and represent the bright promise of the region. But perhaps most inspiring of all is Bishop Akiri’s plans for a secondary school for girls in Tarime. Although education for girls is a priority across Tanzania, there are simply too few schools and resources, especially in rural areas like Tarime. But as the father of two girls of his own, who are both currently in college, Bishop Akiri knows the importance of educational opportunities and is committed to making his vision a reality. Our students always hate leaving Tarime and Bishop Akiri. And it’s not surprising that Danielle, Lyndsey and Mathew are eager to return. Not only will they contribute to Bishop Akiri’s vision through engaging with educational and training programs, but they will also work to establish projects for future UB students and faculty to work on. As our crowdfunding campaign continues to build momentum, we wanted to be sure to highlight a community partner who is particularly dear to us. You could say that our engagement with Tanzania, and more specifically the Mara Region, began with this amazing woman, Sister Janepha Mabonyesho. Although she now serves as Development Director of Baraki Sisters Farm, she was a student at D’Youville College in Buffalo, NY when I first met her back in 2007. The story of how I, Mara, first connected with this nun from the Mara Region of Tanzania is a remarkable one, and is detailed in Stories from the Tanzania Education Project, a personal narrative that I co-authored with Dan Nyaronga, Empire State College professor and my co-instructor, who happens to also be from this very same region (talk about coincidences…). Fast forward our friendship 10+ years and imagine our joy in visiting Sister Janepha at her farm in Baraki, a comprehensive agricultural project that both fascinates and inspires our students to explore issues of social entrepreneurship and business. At the center of Baraki is a fully functioning dairy farm that produces milk under the Baraki Sisters brand, while also providing pasteurization and a market for local women, along with raising livestock and agricultural crops to serve the community. Baraki also provides education through its pre-primary and primary schools in addition to healthcare through its full-service clinic. These social services when coupled with the dairy business represent a progressively comprehensive approach to community development. When students learn about Baraki’s long history, started in the 1970’s as an innovative community development initiative, they gain a new perspective on innovation that challenges their assumptions and cultural biases. But as Sister Janepha shares with our students, there are many challenges to the fiscal sustainability of the project and many opportunities for students and partners to add value through ideas and engagement. Sister Janepha looks forward to hosting our students and involving them in the work of Baraki. She and her fellow Sisters graciously welcome other potential partners to experience the many facets of Baraki and explore exciting opportunities for collaboration.